I’m just so damn Versatile! This was such a lovely – and timely – Christmas present! I say “timely” because I was just counting my blessings this holiday season that, between my PR courses and this blog, I get to spend every day doing something I love. Thank you, Ambitious Poet, for thinking of me for this award! It’s always a wonderful thing to know that somebody enjoys reading my blog as much as I enjoy writing it. I believe in extraterrestrial life. I do. Not necessarily the little-green-men-in-flying-saucers type of life. I just think that it’s more impossible to imagine that in the vastness of space, we are the only planet able to sustain life. I failed the written test for my driving learners’ permit three times. I still maintain that a driver who makes sure everyone in the car is wearing a seatbelt is the best answer. I can’t roll my “r’s”, like how some people can when they say things like “Arriba!”. The catch is that French is my second language and rolling r’s is pretty key, so I kind of just learned to emulate the sound by doing interesting things with my vocal cords. As an only child, I had to create my own fun when I was little. My solution was to dream up an imaginary boyfriend, Peter. I remember telling my mom once that he didn’t have a job, so she told me to dump him. I did. I was traumatized by a swim instructor when I was five which resulted in me being terrified to put my face in any water for about another five years. To this day, I don’t so much put my face under the shower head as cup a handful of water and throw it at myself. I completely believe in karma. What you do will come back to you, so don’t be a douchebag! Zoos make me sad. It doesn’t matter if it’s old and run-down or the nicest, newest facility; some tire swings and sunning rocks don’t change the fact that the King of the Jungle is stuck in a box for the rest of his life. Write a post linking back to the blogger who nominated you, and share 7 things about yourself. Inform them of their nomination with a comment on their blog. 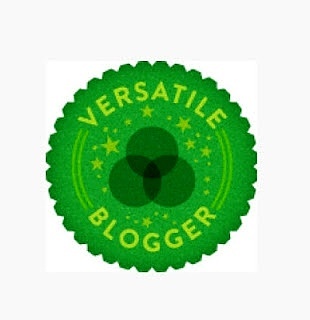 For more information, check out the Versatile Blogger site! Hello and thank you so much for the nomination! Life is cray right now, but as soon as it calms down for a second I will put up the VBA post. So exciting!